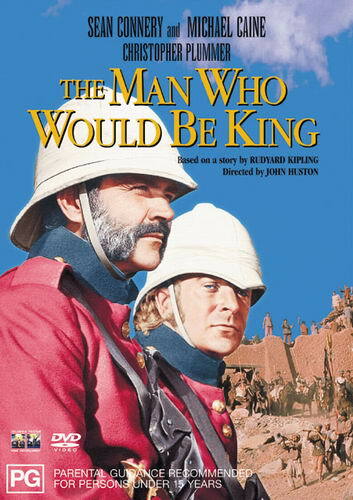 My pick for the greatest adventure movie of all time would be John Huston's The Man Who Would Be King. It looks magnificent, has a great cast (with Michael Caine giving one of his finest performances, and Sean Connery and Christopher Plummer also superb), and it combines adventure with an intelligent and moving story. It was material that was simply perfect for Huston, and apparently he'd wanted to do the movie for 30 years before he finally got the chance to do so. Anyone else like this movie? It is a very good movie. Caine and Connery are terrific, and the cutting of the bridge scene has always stayed with me. The film doesn't seem to fit into the cinema of the late Seventies, which is when it came out, but it still managed to make a mark, which shows how good it is.
" The Knights of Malta " , as the " Knights Templar of Malta ", the modern day Freemasons claim descent from " The Templar's ". I wonder if any other Director has some many Masonic and pseudo - Masonic references in his films. In " The Natural " Hobbs ( Redford ) plays for the " New York Knights ", another Masonic reference ? I always thought that the Knights in "The Natural" were an Arthurian reference, with Roy Hobbs' bat as something like Excalibur. The Grail Legends play a role in Freemasonry. Please see " Morals & Dogma " by Albert Pike, " Mackey's Encyclopedia of Freemasonry ", ' A New Encyclopedia of Freemasonry " by Arthur Edward Waite, and numerous other references icluding " The Secret Teachings of All Ages " by Manly Pamler Hall. " The Man Who Would be King ", also deals with a " Lost King " . A great film that deserves more mention (so I am mentioning it!). Sounds like a research topic at UCLA Film School. Kathy, I'm so glad your hubby made you watch it! The movie is just super, with outstanding performances by Connery and Caine....I don't know why it is one of my favorites, except that it tells a story of adventure, hubris and friendship as simply and elegantly as I've ever seen. The tendrils of the mysterious plot are caught up and explained in a most fascinating fashion. It just gets me, every time. It was among the first two or three movie I ever got on tape, when VHS came out. The opening credits list Shakira Caine. I looked her up - she's Michael's wife. Never noticed that before. I can't remember when, but I was curious about her, too, several years ago, and was surprised to find that she and Michael Caine were married. And what a long marriage it has been, and still is! The pairing reminds me of Robert and Luciana Duvall, although the Caines have been together much longer. Two con artists set out to take over a remote Asian land with a priceless golden treasure. Dir: John Huston Cast: Sean Connery , Michael Caine , Christopher Plummer . I have insomnia and I am watching it now. Since it is not putting me back to sleep, it must be good! This is one of those great films where, if someone says "be warned, it doesn't quite fit in with today's cultural sensitivity, be prepared for uncomfortable dialog and ..." --I want to prepare a vat of boiling oil and shove them into it. Today's cinema has movie franchises like 'Saw' and 'Human Centipede' and "Fifty Shades" --so who are we kidding? Well a TCM host is very likely to give such a 'warning' as part of their intro comments. I'm kind of neutral on this topic, because there may be a lot of viewers that lack much knowledge on American film history and therefore are clueless (as well as way too many overly sensitive snowflakes). So I can see why TCM might feel the need to appease these folks.